So it’s not surprising that Boston ONLY requires that a qualifying time be accomplished on a course that has been Certified by the country’s national governing body (e.g., Athletics Canada, USATF) in which the race is held. Consequently, and to put it in gambler's terms, some runners are seeing the St. George event and raising it the Revel Mount Charleston Marathon in Las Vegas. Why? Because Revel’s start is at 7915 ft.(= 2412 m.), and the finish is at 2725 ft. (= 830.6 m.) for a whopping average decline of 37.5 m/km. And the overall average slope is about minus 3.75%. For those living in Toronto, Ontario, Revel's slope is similar to the slope on Yonge St., between Hwy 401 and York Mills. 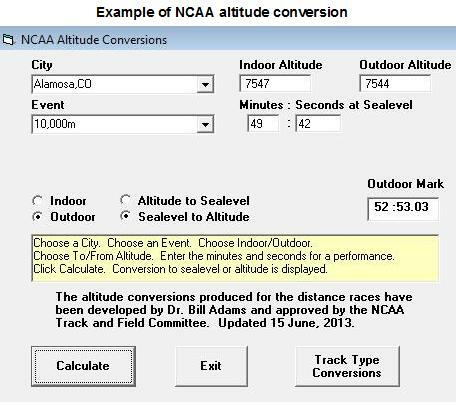 In fact , they came up with a regression equation which predicts, for example, that a 3:30 (=8:00/mile) marathoner running at sea level would run closer to 6:50 /min. if running down a Revel-like slope of 3.75 % slope An advantage of about 70 seconds! And all the runners shout Hallelujah ! BUT Not So Fast – What About Altitude? Yes, what about atlitude. Revel’s Start, at 2412 m., is higher than Mexico City (2250 m.), which is renowned for the negative impact it had on the distance runners at the 1968 Olympics, most famously, multi-world recorder holder, Ron Clarke. In fact, a Norwegian group conducted a study on the impact of altitude on oxygen consumption capability. Their results were published in the European Journal of Applied Physiology in 2006. But Revel is even higher than Alamosa, so I would estimate that our 8:00/mile marathoner would be slowed to running 8:40 per mile if running on a flat grade, especially a non-acclimatized runner. But as we saw earlier, Revel's downhill slope of 3.75 slope provides about 70 seconds gain in speed. Now before you decide on this option be aware that there are several potential health issues associated with High Altitude Sickness, including headaches, suppressed hunger, dizziness, insomnia fatigue and nausea, which could lead to vomiting. Nice. So, if you're a sea level inhabitant, some running at the race's altitude in advance would be ideal since, you're not likely going to have time to acclimatize. And then there's the issue of the much greater impact on the leg muscles and joints which, in an ill-prepared runner, can result in severe tightening of the thigh muscles well before the finish line. This is the same concern as for Boston. So its extremely important that you incorporate a substantial amount of downhill running in your regimen. No question a well prepared should run substantially faster at Revel. But I suggest you read reviews by bloggers and at website posting boards to get a heads up - here are a few links to check out: (1), (2), (3). Now, please no one ask me about the Mt. Everest Marathon which is listed in the Guinness Book of Records as the highest marathon in the world. The start is at 5184m (17,000 feet), and the finish is at 3446m (11,300 feet). Can you imagine you've kept your Everest quest a secret and your spouse walks in on you while you're packing and asks, "what's the parachute for honey?...and what's with the yodeling?"